Most of the documentation is only available in english for now. The unit depends of the site language. Member: edit you account and define your favorite language. The unit always follow your favorite language. On Slacktoday the results depend of the position defined on the box "Where are you now?" (visible at top of pages). This info is private. You are the only one to know your "Current position". It's just a way to filter the results. At your first visit you can allow your browser to find your position automatically. This is helpful if you travel and want to quickly find the slackliners or usual slackline locations around you. The autodetection is also great in case you want to add a new spot on Slacktoday (the location will be automatically filled). You can adjust your position at any time. The minimal format is "City, country" but you can be more accurate. I will be in Brussels next month. What are the usual spots & slackliners over there? > I set my position to "Brussels, Belgium" to filter the results and view only only people and locations from Brussels.. Awesome, now I can contact the Brussels guys and prepare my trip. The basecamp is the place - the area - of your daily slackline location.. Edit your Slackline profile to define your basecamp. This is required to be visible on the Slackliners map. You are free to set your position where you want. 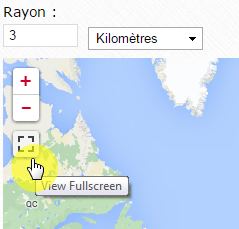 Click anywhere on the map to move the marker and update your position. note: if you have enable the auto geolocalization during your first visit (browser setting) then your Basecamp could be too accurate. Change the marker somewhere else (eg: to your usual slackline location) to avoid the publication of your home address. We don't want to know your private address. You can always disable the auto detection (see your browser settings). I am living in Australia but I am in a trip in Brussels and I will stay there for 2 weeks. 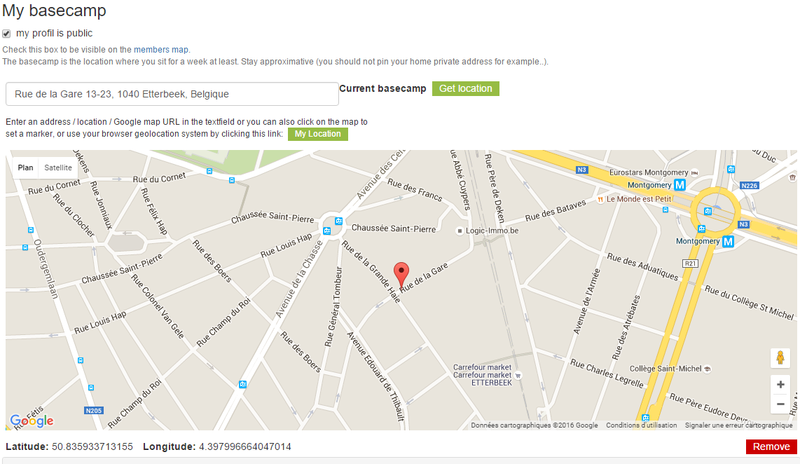 > I am updating my basecamp to find and inform the Brussels slackliners that I am here for the next 15 days. Maybe someone else will join me for a slackline session or I will find a contact in this area. How to be visible on the map ? Register and create your public "Slackline profile" (click your user picture on top right if you are already logged). 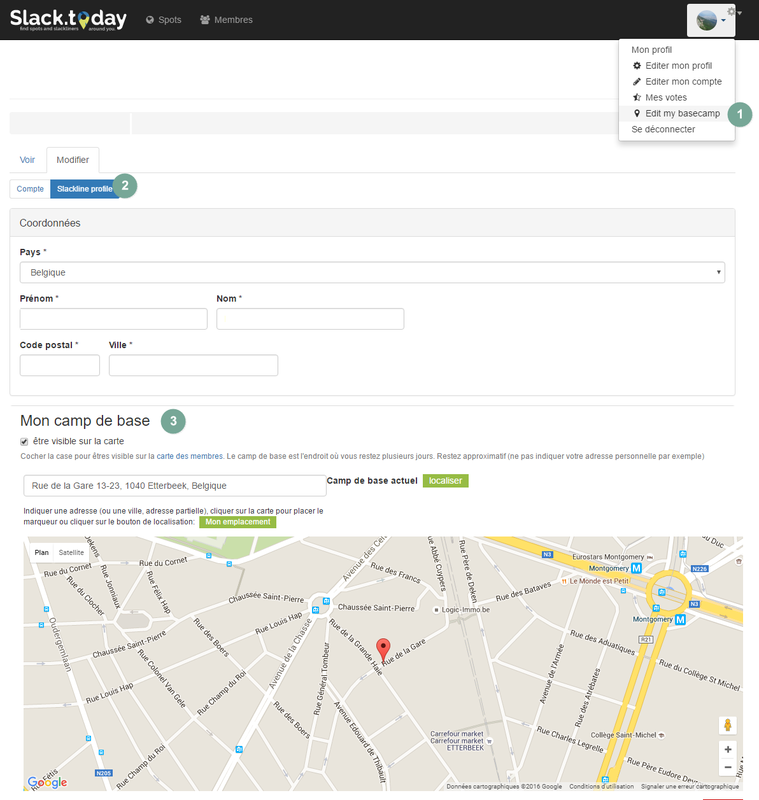 Set your basecamp manually (pin on map). Your basecamp is your daily slackline location. Check the box "be visible on the members map". 1) register on slack.today/register (with quick social authentication method or fill the form username, passoword, email). 3) set your basecamp (you daily slackline location) to be visible on the map. 4) check the box "be visible on the map". Only your username and email are required to register. We don't request other personal data and we will never share them. The social authentication is quite fast and keyboardless! Once your acount opened you can be credited for your lines (open or cross as first) If you create your Slackline public profile you will have a better view on your contributions and you will give a better visibiliy of your activity to the community. We hope you will join us on the members map. The accurency of your position and of your Slackline profile is up to you. You can remove you profile or delete your account at any time. The User Privacy page explains which data are collected and what we do with them.